Getting there: I-96 just, east of US-23 (Brighton). From I-96, take exit 151 (Kensington Road), go north a quarter mile, turn right. OR From I-96, take exit 153 (Kent Lake Road), go north a half mile straight into the park. What's there: The Ski Center is located at the Golf Course. Rental equipment will be available Saturdays, Sundays and Holidays from 10 a.m. to 5:30 p.m. with the last rental at 4:30 p.m. (weather and trail conditions permitting). The Ski Center also offers public restrooms and limited food service. Special equipment rental rates are available for organized groups on weekdays. Please schedule a minimum of one week in advance and pre-payment is required. Both Skate and Classic skis are rented. Trail maps are available at the Ski Center, toll booths or the Kensington Park Office. Skiing is prohibited in the following areas: Nature Study Area and nature trails, sledding hills and toboggan runs, snowboarding hill, and on the golf course greens. Trails are open 6 a.m. to 10 p.m. and they are not lit. Please use only marked ski trails. The park grooms a classic doubletrack plus a skating lane on the glof course. The classic trails get heavily used and the track sometimes get blown away by people with wide touring skis, snowplowers, & walkers. Occasionally, horses can take out the grooming on select trails. The trails run over the golf course, over paved bike paths, and through trails in the woods. There are both flat areas and hilly areas, open areas and wooded areas. Most grooming is usually done with a snowmobile. When there's lots of snow, they will use the heavier Bombadier. The golf course is a popular place for skaters when there is marginal snow or when they want a change from the Huron Meadows Metropark. Although most skaters tend to ski around the outside perimeter of the golf course, going up and down the inside fairways is great! The golf course tends to hold snow pretty well. We've been skiing on it when it seemed most of the snow around the area had melted away. 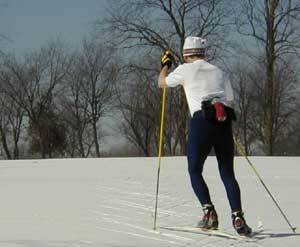 Up-north skiers are always surprised with how good the skiing can actually be at Kensington!